We welcome members from Wirksworth and the surrounding area and villages. If you'd like to know more, please go to the membership page and if you're thinking about joining us, go here to find out how. For information on past events, go to Past Events and News. Film fund-raiser (for INdependDANCE's tour to Edinburgh Fringe Festival), cult French Film from 1980's, includes food and bar. Come and delight in the beautiful music, cinematography and suspenseful story-telling of a multi award-winning cult French film, in support of INdependDANCE's new production trip to Edinburgh Fringe Festival 2019. Includes showing of The Romeo and Juliet Project before food, bar and mystery feature. Tickets in advance £12 (includes food and first drink) from Debi: 07900 690237 / debi.learningthrougharts@gmail.com. All proceeds to company cost of Fringe tour. Showing of The Romeo and Juliet Project dance film by INdependDANCE at 6pm; food and bar 6.45pm; feature film 7.30pm. Raffle for sofa and armchair seats. to see a short slideshow and hear about the latest visit and about Varallo in general. This evening is open to all so please invite friends, colleagues and anyone from other community groups who you think would be interested. We look forward to seeing you on 8 April. If you have any thoughts or comments but can't it make that evening, please let us know. 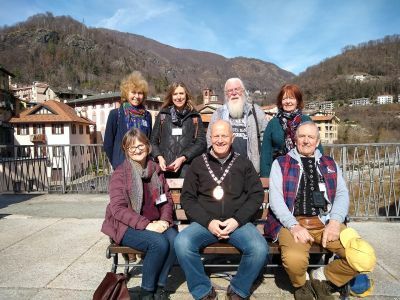 3 March 2019: Nine visitors from Wirksworth, including our Mayor, Chris Whittall, are being hosted by members of the Varallo Twinning group over the Carnival celebrations. We are hoping that a group from Varallo will be able to make a return visit next month. Tickets (£11) are available online from the Northern Light Cinema. We'll be selling wine to go with the nibbles and the normal NLC bar will be open. 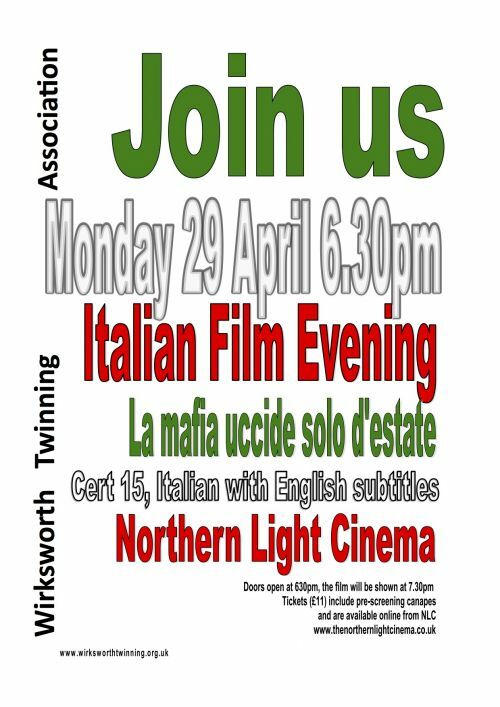 Proceeds from the evenings go towards putting on an exiciting programme of activities for guests that visit us here in Wirksworth from our twin towns every three years. Many thanks to those of you who joined us for the AGM. We looked back over the last 12 months and forward to the next 12 (there will be more to follow on the Frankenau trip when we have more details…). We also invited you to let us have suggestions for Twinning and we’ll be looking at those at the first meeting of our new committee next month. If you couldn’t be there and have any comments or suggestions you’d like to make, please do let us have them. For those of you who weren’t able to be there please click here to download a copy of the presentation that was given. On 3 November Wirksworth Community Choir welcomed singers from Die Cantat for the WW1 commemoration concert, which was held in St Mary’s Church. Singers from Raise Your Voices who travelled to Die in August also joined the choirs for the concert.